How can I debounce a method call in Swift 4? Should I be worried about accidentally invalidating all my provisioning profiles? Why am I getting errors when trying to test a release build with Xcode 8 Automatic Signing? I just received an email that my iOS Distribution Certificate is expiring. What do I do? Xcode 8 introduces a new default way to manage provisioning profiles and signing certificates called Automatic Signing. Automatic Signing can make managing provisioning profiles much easier, but for some developers it can be a frustrating experience at first. Especially for developers who have been using Xcode before automatic signing, it can be confusing to get the Xcode project configured correctly, and to understand what Xcode is now doing at each step in the new workflow. If the release build configuration incorrectly specifies a Distribution Signing Identity, Automatic Signing will no longer be able to operate, and Xcode will produce a build error informing you to fix the configuration. Just update the top-level “Code Signing Identity” to “iOS Developer” to correctly configure the project. When archiving the app, it will be signed with the Developer Identity. The Xcode Organizer now has the ability to re-sign the archive with the Distribution Identity when needed. For example, when you use the Xcode Organizer to upload an archive to iTunes Connect, Xcode will include the Production provisioning profile and re-sign the build with the Distribution Identity. 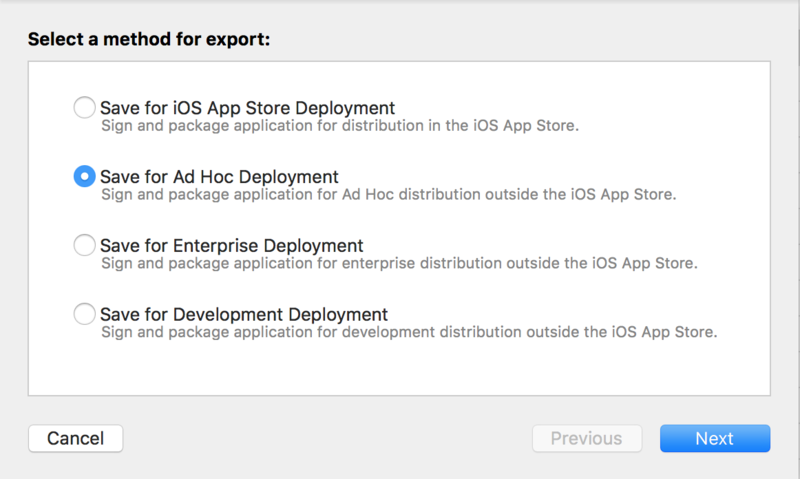 In this way, iTunes Connect will receive your app build with the correct provisioning profile and code signing. However, this new workflow presents a problem for certain testing scenarios. Specifically, if you need to test a feature such as Push Notifications in the fully production environment, the build you test must be provisioned for distribution, unlike what happens during a normal “build-and-run” development cycle. First create the archive. Xcode will create a release version of the build and code sign it with the Development Signing Identity. The archive will appear in the Xcode Organizer window. Click the “Export…” button to allow this archived release version of the app to be deployed on different devices for testing. Choose the Ad Hoc option. Xcode will re-sign the build with an Ad Hoc Distribution Provisioning Profile and Production Signing Identity. Once the Ad Hoc export has been tested, you can then use the exact same archive to upload to iTunes Connect. This workflow has the benefit of ensuring that you are testing the same compiled code as what is submitted to iTunes Connect. That means the archived code is the same between testing and what is delivered to the App Store. Likewise, if you need to test a build that has previously been sold on the App Store, you can use the archive for that build to generate an app file you can install on your test device. Subscribe to the newsletter to stay up to date with new articles. Next Next post: Should I be worried about accidentally invalidating all my provisioning profiles?